5 years ago, I learned my Breast Cancer metastasized. I was terrified, angry, but not surprised. A close group of friends I met through the LFS Support Group reassured me that this was not the end, it was a beginning. We met for the first time in person November 2013, in the bar of the Longwood Hotel, Boston. We were the unruly gigglers in the back two rows of the LFS Conference. We reached out to others on breaks, letting them know about our online support group. We shared laughs, tears, stories of hope, stories of loss. We were going to live LFS together, and help others along the way. 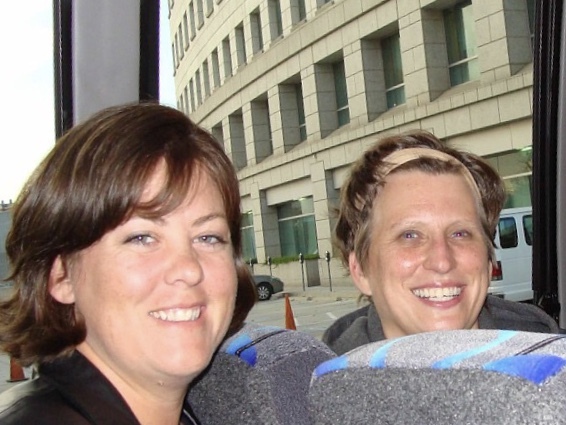 I had been to the first LFS conference in 2010 at the NIH. The experience was overwhelming, thrilling, and life changing. I met Dr. Joseph Fraumeni. I absorbed the science like a sponge. I met lifelong friends there, like John Berkeley, the first President of LFSA. We tried to navigate setting up a nonprofit for LFS while constantly cancering. 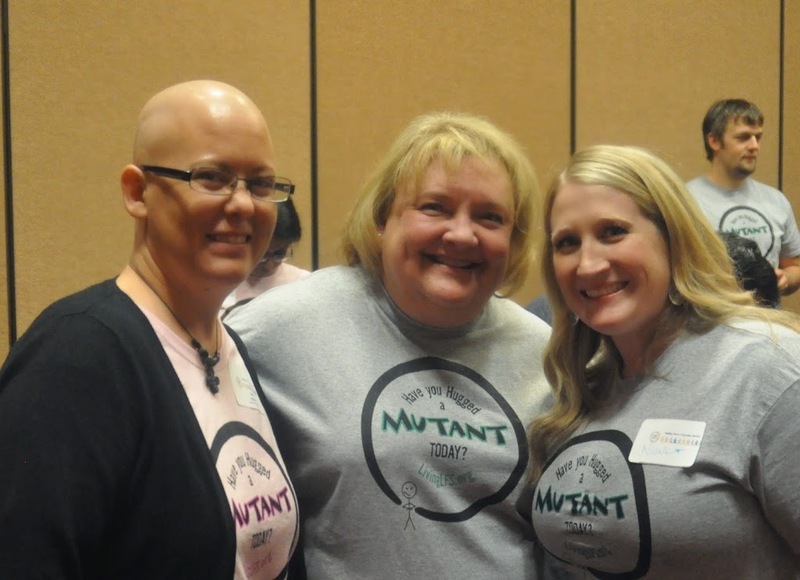 We teamed up with others, like one of my best mutant friends, Trishia. So much to be done: awareness, advocacy, support, RESEARCH! 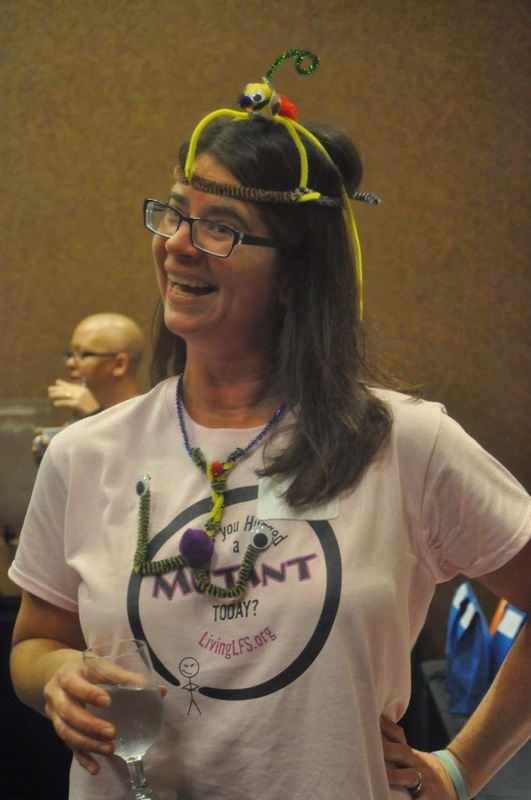 Yet, it was 3 years later at the bar in Boston, through snarky jokes, expletives and many beverages, a smaller group of constantly cancering mutants decided to focus on the living and the need for support. Living LFS was born based on our values as a misfit group of mutants, with the hope of including all. We offered more than “just support”. We helped others meet up. I became President of this non-profit, with good friends and fierce advocates by my side. Living LFS is my Tribe. In the past 5 years, Living LFS has been my focus. 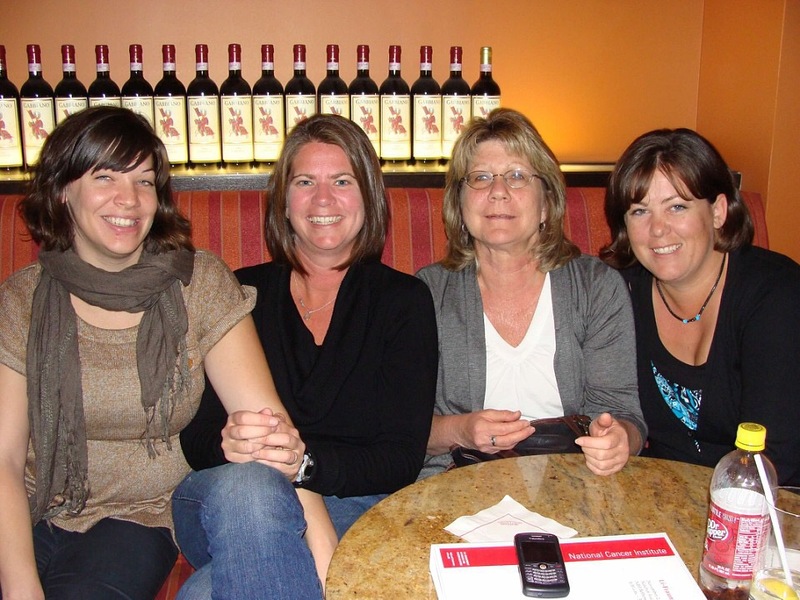 The women who started it with me, my sisterhood of traveling mutants. We laugh at inappropriate things and use the term mutant with the highest regard and endearment. 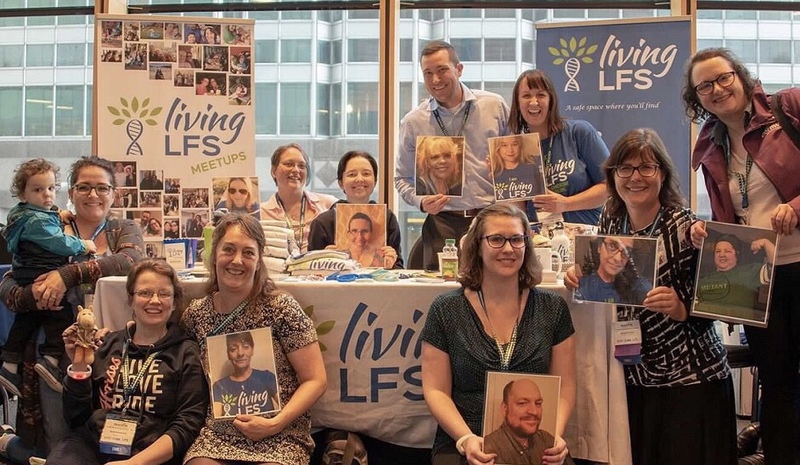 We set lofty goals – regular meetings, conferences, telling stories about LFS to raise awareness, advocating to helpothers live their best possible life with LFS. From each one of my living LFS sisters, I’ve learned valuable lessons that made my life better. I could not have gotten through the past years without them and you. We are all Living LFS. 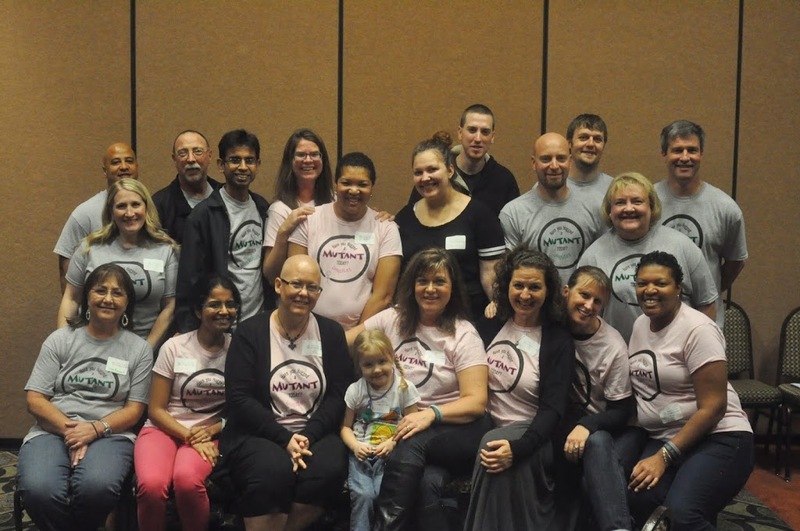 Over these years, every single one of our board members dealt with cancer personally. There was very little medical quiet for any of us, yet we knew we were not alone. Growing up in a cancer family when there was very little support, it is very important to me that others have options for support. I am grateful for the professionals who work so hard to help find our families better screening, treatments, and hopefully a cure. I believe whole heartedly in the need for advocacy and awareness. I also know the fear and loneliness that accompanies being diagnosed or living in a family with a hereditary cancer syndrome like LFS. It is overwhelming and frustrating to reach out for support to find there is none. I know what it is like to live where there are not a lot of resources for families with cancer. 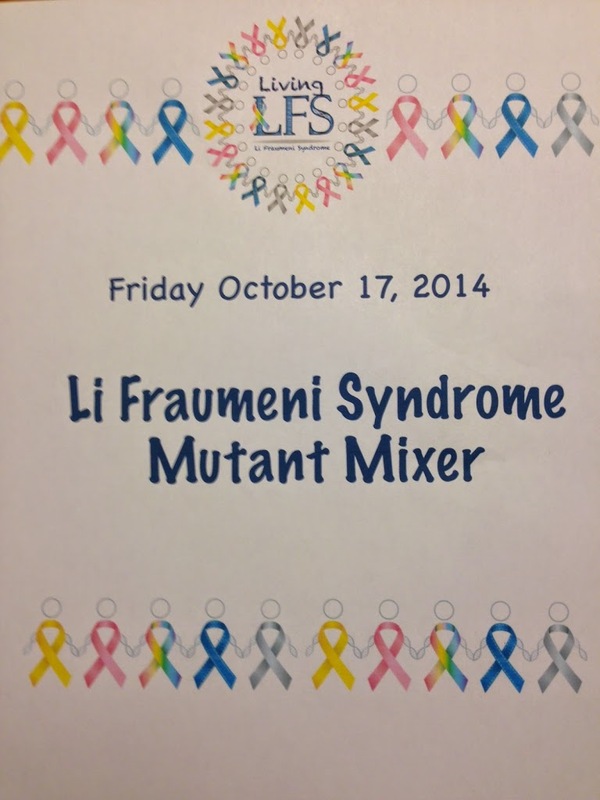 I know what it is like to have to teach professionals how to spell Li-Fraumeni and pronounce it. I’ve been walked through clinic halls like the rare specimen. I’ve debated risks and benefits of screening and treatments until my brain hurt. (It was not a toomah!) 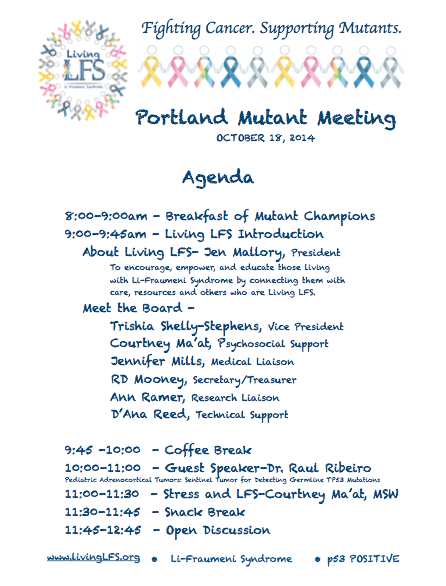 I’ve taken the opportunity to talk with baby-docs and residents about LFS and being a parent of a cancer kid. I’ve spent months calling to schedule appointments, fix billing issues and know friends who have rooms full of paperwork that needs follow up. Through it all, the most resilient people I’ve met are those living LFS. I know what it’s like to walk into a room full of people and feel absolutely alone until another mutant starts chatting and it’s like you’ve known each other your entire lives. I’ve wished and prayed for B9 for more biopsies on more friends in our support group than most people do in their lives. I’ve laughed at poop jokes and crazy medical happenings and the occasional funeral story. I’ve cried with friends out of fear and loss. I’ve compared scars and chemo craziness. I’ve been hugged so hard I know broken pieces stuck back together. I’ve learned so much over these years, way more than I shared. I know there are others like me and I am not alone. I cannot possibly thank every individual here who gave me back confidence when I doubted, picked up the reins when they fell and guided the team with our mission, towards our vision. To each person who sought me out for a hug, who champions for so many different cancers we face, for our children. For those who do it quietly and do the things no one else wants to do, I see you, thank you. I must give a huge Thank You to Greg Harper for accepting the nomination to take over as President of Living LFS. He already dedicates so much time and energy to our community, I am excited to keep working with him on upcoming support initiatives. Like previous founders and board members, once you are living LFS, always living LFS. I am not leaving, but I need to focus on some personal things – and I can do that, knowing the organization is in good hands. It is time for me to share Living LFS. Although I am stepping down as President, there are so many good things ahead for us and I will always be a part of the organization. To each and every new friend I’ve made through living LFS, thank you. For giving me support, personally and professionally. For every T-shirt sale, donation, fundraiser, card. Thank you for your time, your kind words, late night calls, messages, long distance visits and shared experiences. Thank you. For helping me create something special. Thank you for helping me LIVE. 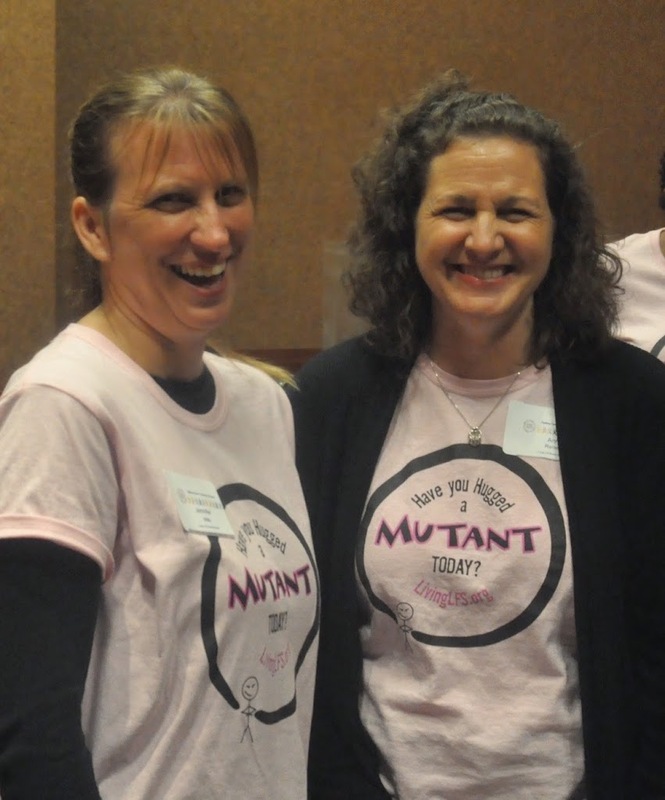 At 6pm on Friday, October 17th, 2014, mutants gathered in the Pine Room at the Embassy Suites in Portland, Oregon. As they munched on crudités and exchanged hugs, laughter spilled out into the hallway. 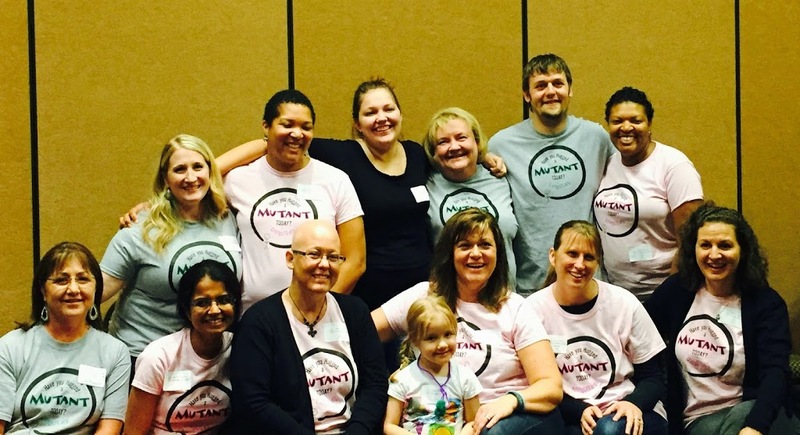 While most would find the subject of hereditary cancer to be anything but laughable, this group of cancer fighting warriors knows that laughter truly is the best medicine. This is especially true when you get to laugh with others who know what it is like to live with Li Fraumeni Syndrome. A round of Mutant Speed Dating got the evening started and gave everyone a chance to spend a few minutes one-on-one with someone else who has been touched by LFS. We shared stories of scars and scares, recovery and hope. 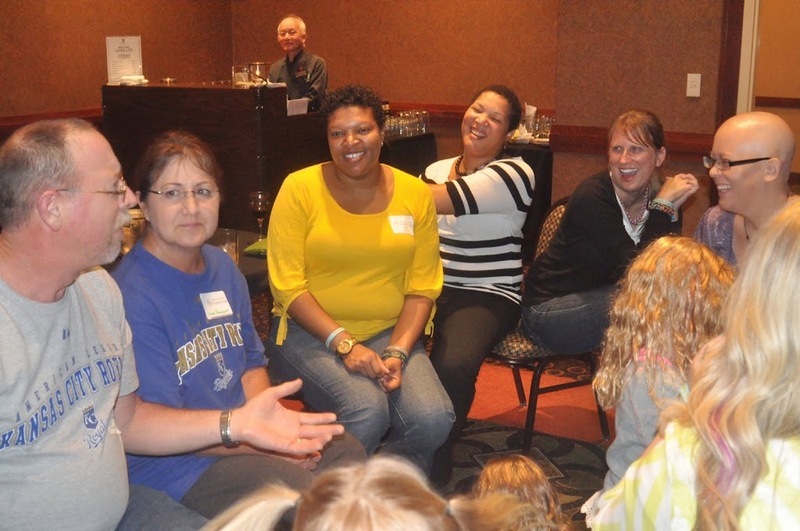 There were spouses who got to meet other spouses for the first time. After the common topics of football and occupations were adequately explored, they ventured into other areas of conversation, the ones not usually touched upon, as the menfolk recognized that they were in the company of others who truly understood the fears of walking alongside someone who is living LFS. A mini mutant found friendship with two other children, whose mother has LFS. They played hide and seek while the moms discussed reconstruction and testing and the particular issues of parenting with LFS. Young adults discussed the unique challenges of having multiple cancers by their early 20’s. Despite the unusual topics of conversation, it felt more like a family reunion than a support group social. The evening ended with everyone looking forward to seeing their new friends the next morning. Bright and early, the Mutants congregated for breakfast. Everyone trickled into the meeting room excited to learn what was in store for Living LFS. Of all the luck, I had gotten a cold and had all but lost my voice for the meeting. I did the best that I could to explain how Living LFS had come about. In 2008, my daughter Lily was diagnosed with Adrenocortical Carcinoma and a sarcoma. I began reading papers online and researching what our best treatment option was. It was very disheartening, as everything I read carried the words “poor prognosis” and “poor survival”. However, I noticed that there was a name that kept popping up over and over- Dr. Raul Ribeiro from St. Jude’s. If I found a paper about pediatric adrenal tumors, he was usually associated with it. As a resident, while studying medicine in Brazil, Dr. Ribeiro noticed there was a higher than average incidence of adrenocortical carcinoma. He and his team found a cohort, a genetic link and eventually a specific TP53 mutation that is associated with these families. I figured if anyone could answer my questions about LFS and my daughter’s chances, it would be this man. So, I found his office number online and left him a message. 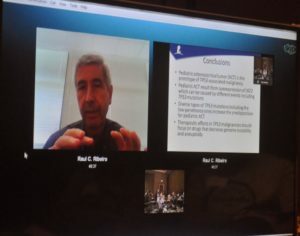 No more than a few hours later, Dr. Ribeiro called me back and we discussed his experiences with LFS, adrenal tumors and the registry he had created for these tumors- IPACTR- International Pediatric AdrenoCortical Tumor Registry. He took the time to talk to me during a very scary point in our lives and I have always appreciated this and respected him for it. In 2009, while my daughter was in chemotherapy, a regimen that Dr. Ribeiro had helped me to decide on, I started looking for other survivors of adrenal tumors. My other children had tested positive for the mutation, so we had officially become a family of mutants. A friend directed me to Facebook, and when I searched Li Fraumeni Syndrome- there was nothing but a page with 6 followers. I knew there were other families out there like mine and social media seemed like it might just be the way to find them. 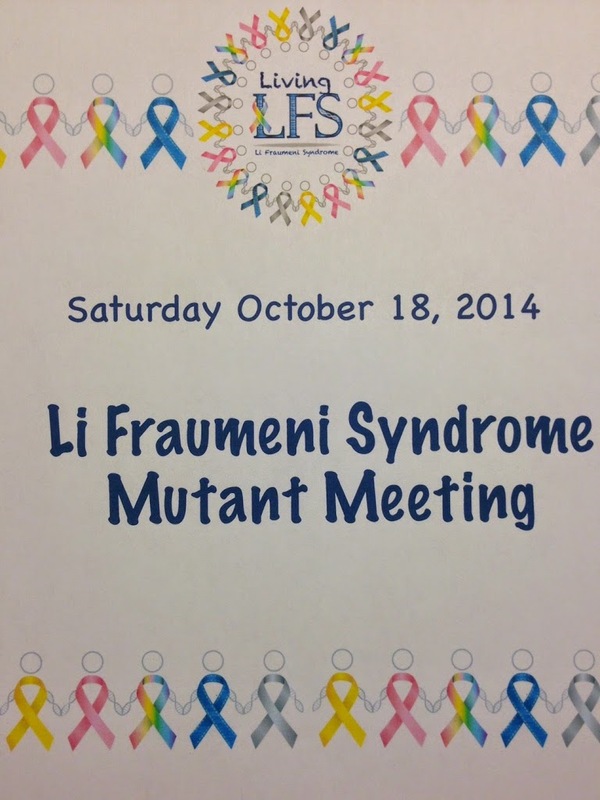 I started a Li Fraumeni Syndrome group and invited my family. I then invited friends I had met on MD Junction. Every few months we would get a new person looking for support and by 2013, over 300 members gathered online, asking questions, sharing experiences and helping each other make some of the toughest decisions of their lives. 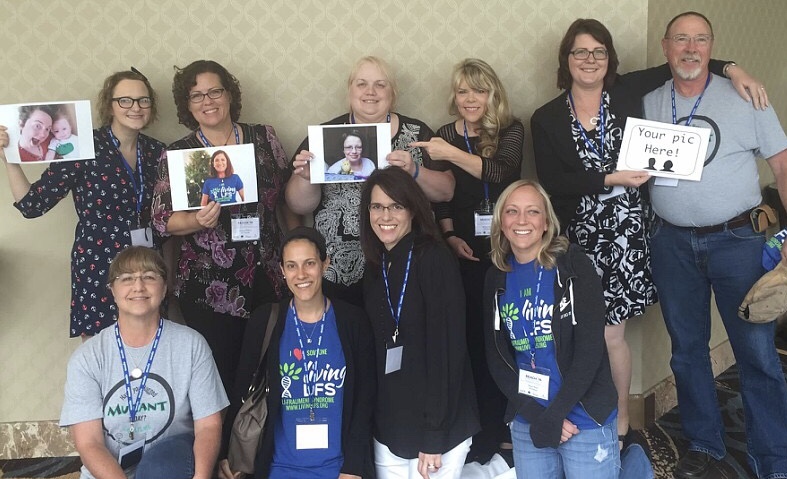 Many of us got to meet in person, in Boston at the LFS conference last year. We were excited for more meetings. We decided the best way to make sure that we got our mutant fix was to arrange these meeting ourselves. Thus, the Portland Mutant Mixer was born. At this point, a few of the amazing women who are helping to make Living LFS a reality took turns introducing themselves. Trishia Shelly-Stephens is an active supporter of the LFS community and serves as our Vice President. We honored our Secretary/Treasurer, RD Mooney who, due to a recent diagnosis and surgery, was unable to be with us despite being a driving force behind our incorporation and filing of non profit paperwork. Courtney Ma’at, a Social Worker, is helping us with Psychosocial Support. Jennifer Mills, an RN, is serving as our Medical Liaison. Ann Ramer, is our Research Liaison and self proclaimed medical information hound. D’Ana Reed is providing us with technical support. Mostly, each one of the Board Members has intimate experiences with LFS and wants to help bring the LFS community together. 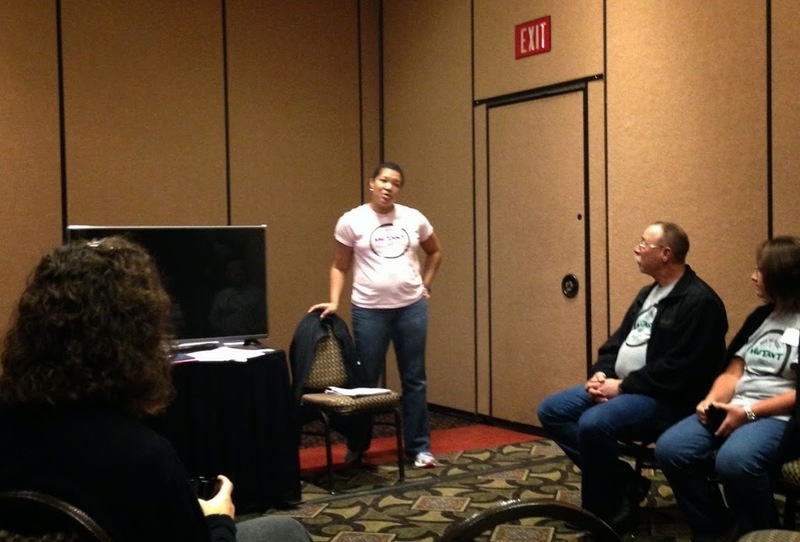 When we decided to meet in Portland, we thought it would be great to have a speaker for the group. I immediately thought of Dr. Ribeiro. Dr. Ribeiro graciously accepted our invitation to speak via conference call and prepared an amazing 30 minute presentation on Pediatric Adrenocortical Tumors as Sentinel Tumors for Detecting Germline TP53 Mutations. A summary of his talk and slides from the presentation can be found HERE. Dr. Ribeiro went on to spend another half an hour expertly answering questions from the group. His work is an excellent example of how screening and early detection can save lives. After Dr. Ribeiro’s talk, we broke for coffee, tea and fruit, then heard from Courtney Ma’at who spoke about Stress and LFS. She made profound comparisons between Post Traumatic Stress Syndrome and LFS. She also shared some tips on how to identify and to cope with the stress of LFS and will be sharing those with us in a future blog post! We ended the meeting with an open discussion about future meetings(we are looking at October 2015- location to be determined) and possible fundraisers. We quickly posed for a group picture and I for one had a tough time saying goodbye- so, many of us caught a train to town and had a final dinner together!